If you took a walk through the GrassRoots Sustainability Fair between the Grandstand and the Infield stages, you were most likely showered with enthusiasm, pamphlets, and information about renewables and activism. You were able to fuel your cell phone at a free phone charging booth powered completely by the sun and provided by Renovus Energy, an always 100% renewable energy company. A few booths away was the “Stamp Money Out of Politics” truck where you could strap one of your bills into a little wooden cart, watch it go through a roller coaster-like house of horrors (where the monsters are humans sporting mouths filled with money), and have your cash come back to you with a slogan like “CORPORATIONS ARE NOT PEOPLE” or “NOT TO BE USED FOR BRIBING POLITICIANS” in an effort to build a movement to amend the constitution to remove money from politics. You could completely feast your eyes on the Weaver Wind Energy shiny new wind turbine. With 24/7/365 video surveillance of this prototype, which took years of painstaking research and development, they believe they can offer the best small wind turbine in the world, with data to prove it. While the blades are currently made in France, all other major parts are made in the U.S.A. and they’re working on procuring American manufactured blades. Their futuristic and adorable windmill may be certified by October of this year to be ready for sale and installation in spring of 2014. With a life expectancy of (a maintenance free!) 20 years, the turbines will always be locally assembled at their Cherry Street headquarters in Ithaca and gently delivered onto your property by crane. 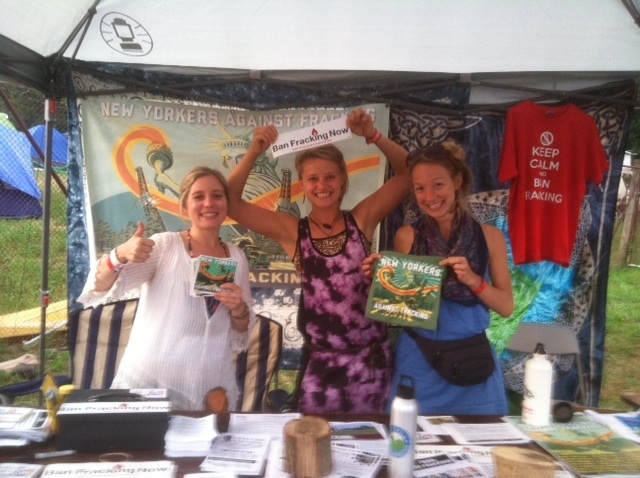 Well-informed members of the New Yorkers Against Fracking coalition were on hand to invite everyone to a fundraising music festival taking place on Saturday August 10 at Stewart Park. “Rock the Plan” will be celebrating the “2030 Plan,” a vision for how the state can switch from fossil fuels and nuclear power to completely renewable energy by 2030. We can also join them in greeting Governor Cuomo during Governor’s Day at the New York State Fair in Syracuse on August 22. Keep the pressure on our Governor to ban fracking in New York for good, and for everybody’s good. As Organizing Director Renee Vogelsang told us, “Wherever Cuomo is, we go!” Thank you, New Yorkers Against Fracking. Keep up at www.NYAgainstFracking.org. 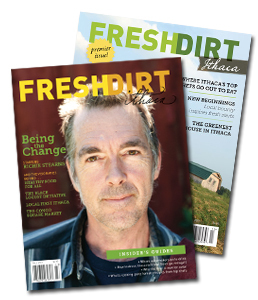 ← GRASSROOTS Recycles! Composts! Urges You to Reuse!